Lumos Medical Center, a primary care clinic offering a unique blend of Eastern and Western medicine, celebrates its first anniversary with an open house on Wednesday, August 22 from 3-7pm at its location at 335 NE Revere. The public is invited to enjoy an afternoon featuring mini treatments, such as free chair massage and acupuncture, music, refreshments, tacos from El Sancho, yard games and over $500 in raffle prizes. Lumos Medical Center was founded by husband and wife duo Drs. Ren and Christy Bedasbad who envisioned a healthier community for Central Oregon by providing a model that combines Western and Eastern approaches to healthcare. Through the lens of naturopathic medicine, they work on finding and treating the root cause of one’s symptoms and supporting the body’s ability to heal itself through multiple treatment options. Among the alternative treatment options offered at the Center are acupuncture, botanical medicine, nutritional counseling, supplementation, homeopathy, hydrotherapy and physical adjustments. Dr. Ren and Dr. Christy met in 2010 at the Southwest College of Naturopathic Medicine, and also studied at the Phoenix Institute of Herbal Medicine and Acupuncture. August marks their first year as a clinic, and third year of practice in Central Oregon. As primary care physicians, Drs. Ren and Christy provide complete care for patients of all ages, from pediatric to geriatric. They are commonly sought for gastrointestinal disorders (including Irritable Bowel Syndrome, heartburn, food allergies), mental disorders (anxiety, depression and stress management), chronic conditions (rheumatoid arthritis, fibromyalgia), fertility treatments and pain (chronic/acute, MVA, sports injury and recovery). They offer annual physicals, sports physicals for children, order imaging, blood work and specialty labs, prescribe medications and refer to other practitioners and specialists as needed. Their referral partners are located throughout Central Oregon and include Oregon Reproductive Medicine in Portland. The practitioners at Lumos Medical Center are committed to helping people achieve their health goals and spend one-and-a-half hours of face to face time during a patient’s first visit, giving the doctor an opportunity to fully understand the patient’s concerns, perform a comprehensive physical exam, educate on the condition, discuss an individualized treatment plan and answer any questions. Between visits, the doctors are available to patients by email. They also provide free, 15-minute phone consultations to prospective patients so they can decide if this is the right fit for them. 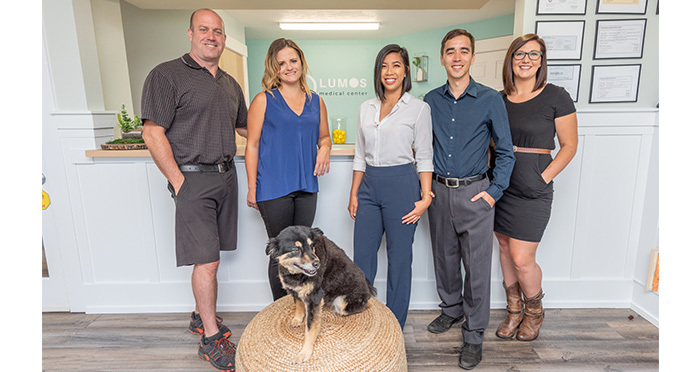 Lumos Medical Center is open five days a week, Tuesday through Saturday, and is located at 335 NE Revere in Bend. The clinic currently has four practitioners, which consist of naturopathic physicians, acupuncturists and a massage therapist.